Unlike other herons and egrets, who often move slowly and stealthily, the Tri-colored Herons are almost always in constant motion. They fly quickly from one place to another, seemingly in a hurry to do some something important, or they dart about in the ponds, flitting from one spot to another, jumping up and spinning about when they spot just the right tasty fish. But not this guy! I was taken aback with how he stood stock still, staring into the water like this for the longest time! Many minutes passed before he even lifted his head, just a tiny little bit. Then he continued sitting and staring into the water, that spear-like beak poised, ready to strike some unsuspecting fish. Finally, after many more long minutes, this exceedingly calm Tri-colored Heron raised his head till he was upright . . . . He had still not caught a single morsel to eat. Much to my surprise, he just stood there in the reeds. It seemed that he was continuing to wait – on the off-chance that a yummy fish might swim by. Then at last, as quietly and placidly as could be, he simply strode off . . . . maybe he wasn’t that hungry, but I never saw such subdued behavior in a Tri-colored Heron! 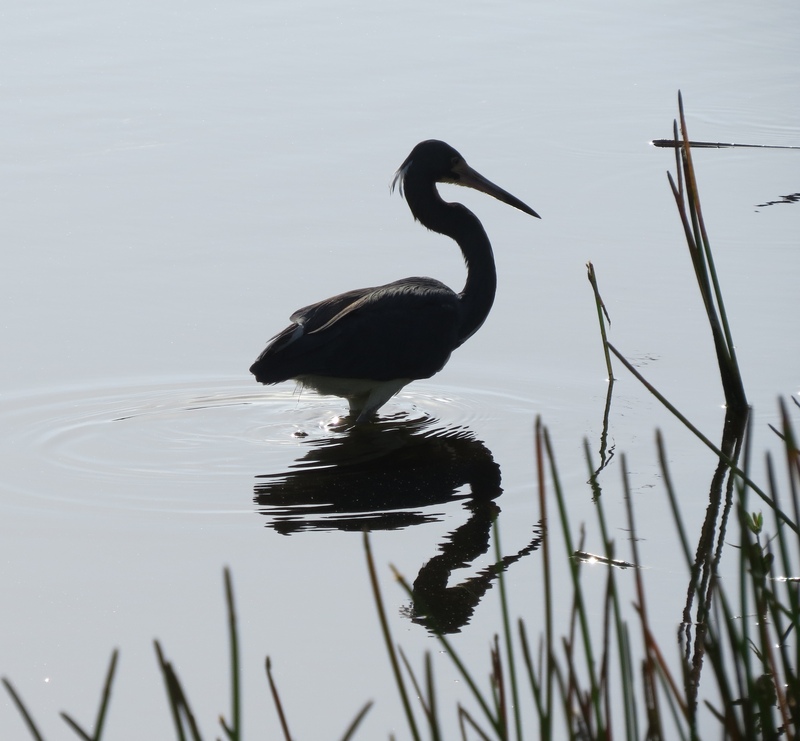 This entry was posted in Birds, Marsh/Wetlands and tagged Tri-colored Heron. Bookmark the permalink. Love those photos! Especially the reflection. Glad you enjoyed them, Lee. 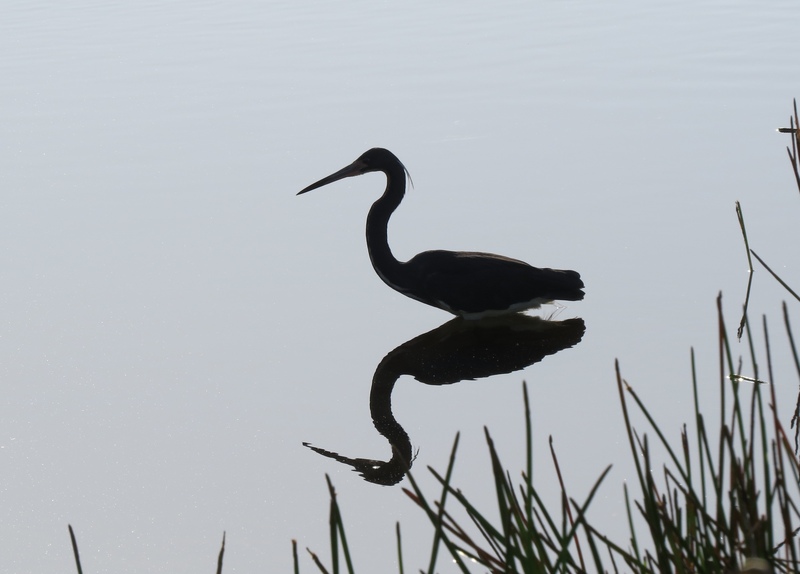 The reflection of this bird was so striking at this time of day! I really like seeing them, but we see them infrequently. The birders all tell each other, but the birds are rather wary. You were quite lucky it stayed put. It’s so interesting how birds are in different locations. 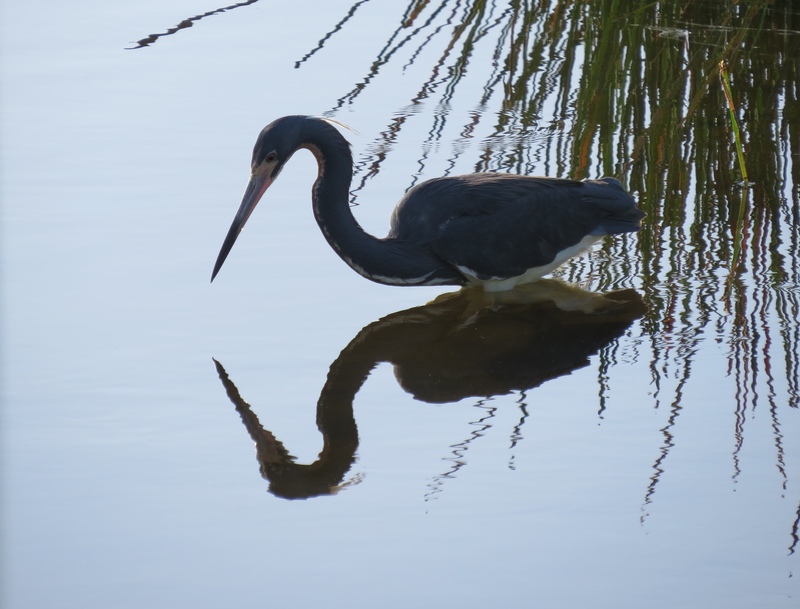 We have so many tricolored Heron of all ages and all our wetland preserves And they are used to people walking by – they often stand right on the boardwalk railings as people pass by. You could practically reach out and touch them! You are right in different areas the wading birds are not wary of people. I have GBH on docks where you could almost touch them. Here they fly away. I guess they think all us in the north carry guns! 😳 sad to think that anyone could possibly shoot birds. 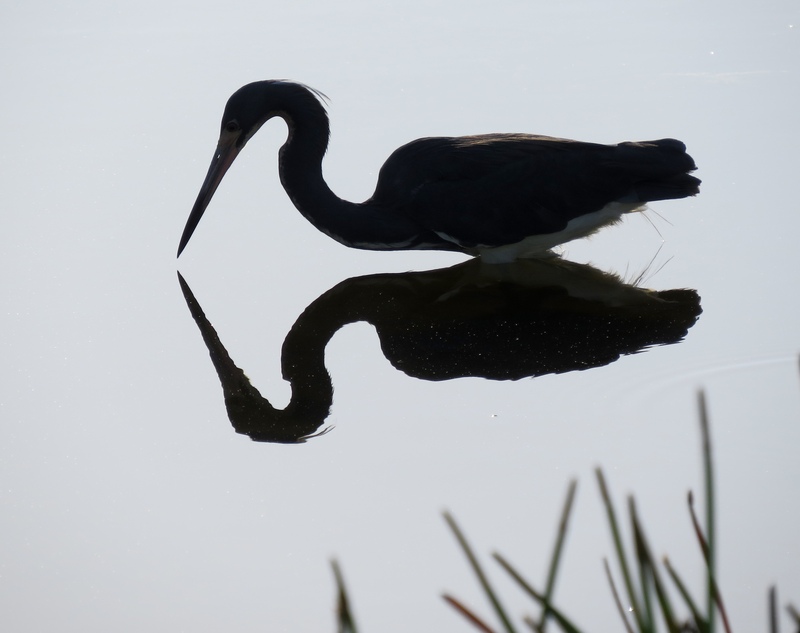 I love beautiful reflections, the Tri-coloured Heron does it well. Great shots! Thank you AB! Yes, that calm still water makes for great reflections. He was taking easy 🙂 Beautiful photos, the reflections are amazingly clear, Bj. I haven’t never seen tri-colored heron. We’re fortunate to have many, many Tricolored Herons nearby, and they are so fun to watch. Thanks for your visits, Amy. Hope you’re having a wonderful day! The photographs are just amazing! BJ, perhaps this Tri Colored Heron was not searching for food. Could be a narcissist and was admiring itself. Waddayathink? Ahh…. Good thought – could be…. !